BOCA RATON, Fla. – Their debates now history, President Barack Obama and Republican Mitt Romney on Tuesday open a two-week sprint to Election Day powered by adrenaline, a boatload of campaign cash and a determination to reach Nov. 6 with no would-have, should-have regrets in their neck-and-neck fight to the finish. 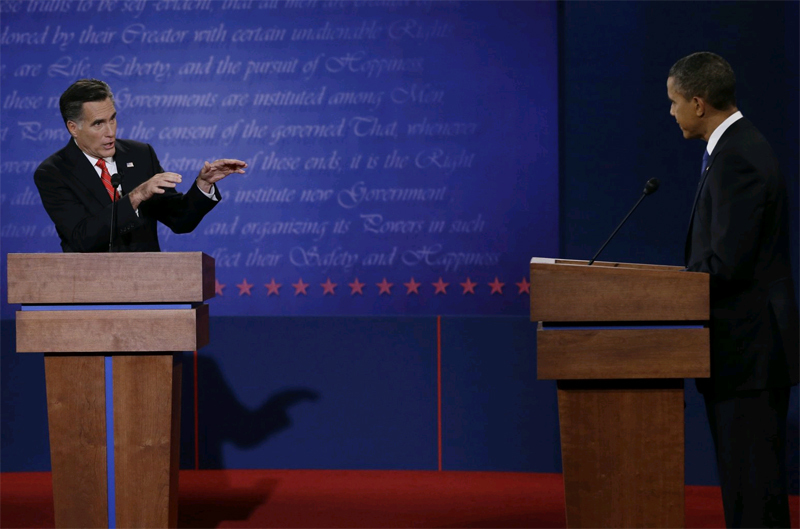 Neither candidate scored a knockout punch in their third and last debate Monday, as both men reined in the confrontational sniping that had marked their last testy encounter. And though the stated topic this time was foreign policy, both kept circling back to their plans for strengthening the fragile U.S. economy – Job 1 to American voters. After Obama and Vice President Joe Biden campaign together in Ohio on Tuesday, the president splits off on what his campaign is describing as a two-day “around-the-clock” blitz to six more battleground states. He’ll be in constant motion – making voter calls and sleeping aboard Air Force One as he flies overnight Wednesday from Nevada to Tampa, Fla. Both candidates are done holding fundraisers – no doubt a happy thought for the two of them. The Obama campaign on Tuesday released a new TV ad touting recent economic gains. “We’re not there yet,” Obama says in the ad, “but we’ve made real progress and the last thing we should do is turn back now.” The ad will air in New Hampshire, Virginia, North Carolina, Florida, Ohio, Wisconsin and Colorado. Out on the road, Romney has been demonstrating more confidence than ever. He’s started making more impromptu stops at local establishments near campaign rallies, a departure from his typically buttoned-down schedule through the summer. His crowds are bigger and more energized, too. And some voters who’ve attended his recent rallies say his performance helps them to see Romney as a plausible president – not just a candidate. He riffs about his rival’s “Romnesia” – a lighthearted way to drive home his opponent’s shifting policy positions. In Ohio, McDonald said, numbers are up across the board – in rural, suburban and urban areas. As many as 45 percent of Ohio voters may cast early ballots, compared with less than 30 percent four years ago, he said. The numbers in North Carolina seem to be shifting in the Republicans’ direction, McDonald says, and those in Iowa “seem to confirm polling showing a slight Obama lead” there. 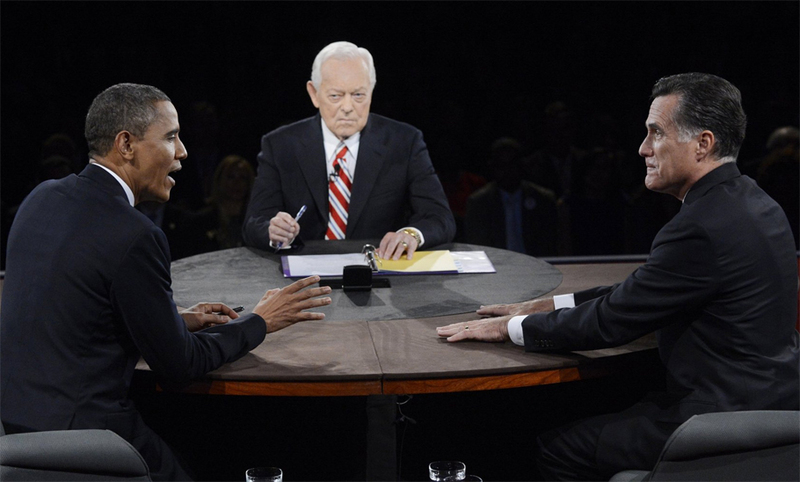 This year’s quartet of debates – three for the presidential candidates and one for the veeps – started on a friendly note, with Romney wishing Obama and wife Michelle a happy 20th anniversary, but goodwill quickly deteriorated. Both men were at times argumentative and the back-and-forth often shed more heat than light. From it all – more than 65,000 words of debate rhetoric – there was no signature moment that is likely to be remembered much past Election Day. SAN FRANCISCO – After all the Giants had overcome to get back to the World Series, a late shower wasn’t about to dampen their celebration. All right, it was a driving downpour. So reliever Sergio Romo danced through the raindrops, Tim Lincecum helped lead a soaked victory lap around the ballpark and Angel Pagan stayed on the field with his daughter long after his teammates took the party indoors. Hunter Pence got the Giants going with a weird double, Matt Cain pitched his second clincher of October and San Francisco closed out Game 7 of the NL championship series in a rainstorm, routing the St. Louis Cardinals 9-0 on Monday night. San Francisco won its record-tying sixth elimination game of the postseason, completing a lopsided rally from a 3-1 deficit. The Giants, who won it all in 2010, will host reigning AL MVP and Cy Young winner Justin Verlander , Triple Crown slugger Miguel Cabrera and the Detroit Tigers in Game 1 on Wednesday night. Verlander is set to pitch Wednesday’s opener at AT&T Park. Giants manager Bruce Bochy insisted before Monday’s game he had not planned any further in advance. Scutaro produced his sixth multihit game of the series and matched an LCS record with 14 hits and Pablo Sandoval drove in a run for his fifth straight game. After falling behind 3-1 in the series at Busch Stadium, the Giants outscored the wild-card Cardinals 20-1 over the final three games behind stellar starting pitching from Barry Zito , Ryan Vogelsong and Cain. They also benefited from some strange bounces. On Pence’s double that highlighted a five-run third, his bat broke at the label on impact, then the broken barrel hit the ball twice more. That put a rolling, slicing spin on the ball and caused it to change directions – leaving shortstop Pete Kozma little chance to make the play. Kozma broke to his right, figuring that’s where the ball would go, but it instead curved to left-center. “It was going to go in the hole and it ended up going up the middle,” Kozma said. Injured closer Brian Wilson , with that out-of-control bushy black beard, danced in the dugout and fans in the sellout crowd of 43,056 kept twirling their orange rally towels even through rain in the late innings – a downright downpour when Romo retired Matt Holliday on a popup to Scutaro to end it. Romo embraced catcher Buster Posey as fireworks went off over McCovey Cove beyond right field. The NL West champion Giants won their first postseason clincher at home since the 2002 NLCS, also against the Cardinals. These 2012 Giants have a couple of pretty talented castoffs of their own not so different from that winning combination of 2010 “castoffs and misfits” as Bochy referred to his bunch – with Scutaro right there at the top of the list this time around. Acquired July 27 from the division rival Colorado Rockies , Scutaro hit .500 (14 for 28) with four RBIs in the NLCS. The 36-year-old journeyman infielder, playing in his second postseason and first since 2006 with Oakland, became the first player in major league history with six multihit games in an LCS. Now, he’s headed to his first World Series. The Giants have All-Star game MVP Melky Cabrera to thank for helping his teammates secure home-field advantage in the postseason – while Cain was the winning pitcher the National League’s 8-0 victory in July. Cabrera was suspended 50 games Aug. 15 for a positive testosterone test, then wasn’t added to the roster by the Giants after his suspension ended. After rain fell on the Cardinals during batting practice, the skies turned blue and the weather cooperated. Anxious players on both sides hung over the dugout rails as the game began. Cain joined St. Louis’ Chris Carpenter as the only pitchers with victories in two winner-take-all games in the same postseason. Carpenter, who lost Games 2 and 6 in this series, did it last year. Cain also pitched the Giants’ Game 5 division series clincher at Cincinnati, when San Francisco became the first team in major league history to come back from an 0-2 deficit in a five-game series by winning three consecutive road games. 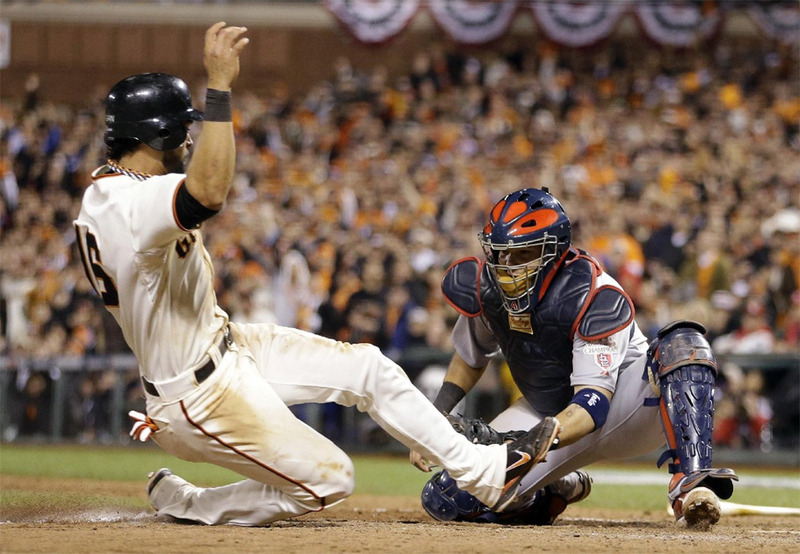 “I think to do it, the guys actually have to believe it can happen,” Posey said. He delivered on an even bigger stage Monday as San Francisco saved its season once again. The Giants won their 20th NL pennant and reached their 19th World Series. Cain walked off the mound to a standing ovation when Jeremy Affeldt entered with two outs in the sixth. Affeldt then got Daniel Descalso to pop out with two runners on. Yadier Molina had four hits but got little help from the rest of the Cardinals, who went 1 for 21 with runners in scoring position over their final three games. Cain added an RBI single to his cause and got some sparkling defense behind him. The play of the game went to shortstop Brandon Crawford , who made a leaping catch of Kyle Lohse ‘s liner to end the second inning with runners on second and third that would have been a run-scoring hit. In the third, Scutaro, the second baseman, made a tough stop on a short hop by Carlos Beltran , and left fielder Gregor Blanco ran down a hard-hit ball by Allen Craig in left-center to end the inning. Cain’s second-inning single made San Francisco the first team in major league postseason history to have a starting pitcher drive in a run in three straight elimination games. Brandon Belt hit a solo homer in the eighth for his first clout of the postseason. It took production from everybody, even the pitchers, for these scrappy Giants to rally back from the brink one more time. Cain certainly did his part to keep the staff rolling. The 16-game winner, who didn’t surrender an earned run during his team’s title run two years ago, reached 46 pitches through two innings but settled in nicely the rest of the way to avenge a loss to Lohse in Game 3. Cain even got to repay Holliday for his hard slide into Scutaro at second base in Game 2 here a week earlier. Cain plunked Holliday in the upper left arm leading off the sixth, drawing cheers from the crowd. The right-hander escaped trouble in the second with runners on second and third when Crawford made his catch. Holliday returned to the lineup after missing Game 6 a night earlier with tightness in his lower back. He received loud boos when he stepped in to hit in the first from a fan base still angry about his slide that injured Scutaro’s hip. Beltran is still left 0-fer the World Series, winless in three Game 7s during his 15-year career. And to think just last fall he was on the other side with the Giants as they missed the playoffs a year after winning the club’s first World Series since moving West in 1958. The Cardinals went an NL-best 12-4 from Sept. 16 to the end of the season to earn the NL’s second wild card on the second-to-last day of the season, then won 6-3 in a winner-take-all playoff at Atlanta to reach the division series. The Cardinals then rallied from a 6-0 deficit with a four-run ninth inning to stun the Washington Nationals 9-7 in Game 5. Sandoval’s run-scoring groundout in the first that put his team ahead gave him at least one RBI in five straight postseason games, matching home run king Barry Bonds ‘ franchise record set in 2002. Now, Sandoval and the Giants get to play on. NOTES: The Giants snapped an 0-5 skid in deciding Game 7s. … The Tigers and Giants will meet for the first time in the postseason. DENVER – Little more than a month from Election Day, Republican Mitt Romney is barreling out of the first presidential debate energized by a solid performance that telegraphed his determination to take it to President Barack Obama with gusto. The president, intent on keeping his momentum from stalling, is warning Americans that his GOP rival’s policy prescriptions for a fragile economy are more fantasy than reality. Standing toe-to-toe with the president for the first time in the campaign, Romney held his own and more at a time when there already were signs that the race is tightening in some of the battleground states where Obama has enjoyed an advantage. Obama kept his cool and signaled that he won’t let up on his message that Romney’s plans on taxes, health care, the deficit and more just don’t add up. “It’s fun,” Romney declared well into Wednesday night’s 90-minute faceoff, clearly relishing the back-and-forth. “It’s arithmetic,” said Obama, hammering at Romney’s conspicuous lack of details with far less enthusiasm. After a few days of relative calm as the candidates prepared for the first of their three debates, the campaign now bursts out of Colorado in all directions, with an itinerary that touches down in some of the most hotly contested battleground states over the next few days: Obama campaigns in Colorado and Wisconsin, then on to Virginia and Ohio. Romney and running mate Paul Ryan are off to Virginia on Thursday, then Romney spends more time in Virginia before moving on to Florida. Vice President Joe Biden is bound for Iowa. With a 13-day break before their next debate, Obama and Romney have time to hone their arguments while their campaigns continuing to bombard the most hotly contested states with negative ads that go far beyond the more restrained jibes the candidates leveled from their respective podiums. Obama made no mention, for example, of Romney’s caught-on-tape remark that he’s not worried about the 47 percent of Americans who don’t pay taxes. Democratic ads, though, have been making hay with the comment. Asked why the president didn’t raise the video, Obama senior political adviser David David Axelrod suggested on MSNBC’s “Morning Joe” that he didn’t need to since it has been so widely seen and heard. “The president’s belief is that’s something that has been very much a part of the discussion,” Axelrod said. In next few weeks, Romney is expected to give a number of policy speeches filling in details as he tries to sharpen the contrast with Obama while answering criticism that he hasn’t clearly outlined his plans. The Republican challenger begins with a foreign policy speech in Virginia on Monday. Subsequent speeches are expected to focus on his plans for job creation, debt and spending. Romney has promised to balance the budget in eight years to 10 years, but hasn’t explained just how he’ll do it. Instead, he’s promised a set of principles, some of which – like increasing Pentagon spending and restoring more than $700 billion in cuts to Medicare over the coming decade – work against that goal. He also has said he will not consider tax increases. Obama argued that it’s all too much. The two candidates planted themselves behind wooden lecterns and faced off before about a crowd of fewer than 1,000 people at the University of Denver. But their policy-heavy debate really was aimed at the tens of millions of television viewers who tuned in, particularly those who are undecided or soft in their support for a candidate. Just the sort of voters who may be less partisan and more interested in hearing specifics. Karl Amelchenko, an Obama supporter who watched the debate at a storefront art gallery in Raleigh, N.C., thought Romney did himself some good. But some voters still aren’t ready to commit one way or the other. Cynthia Gerst, a state worker in Ohio who attended a nonpartisan debate watch party in downtown Columbus, confessed she’s “been under a rock, but now I’m ready” to pay attention. She leans Democratic, but hasn’t made up her mind. “I couldn’t distinguish who was in the right,” she said after the debate. Axelrod said on NBC’s “Today” show Thursday that the former Massachusetts governor had “big gaps in truth that we saw” and said that Obama will set the record straight. He charged that Romney “refused to offer any way to pay” for the broad-ranging tax cut he advocated. “I give him credit for a strong performance. I give him an F for being honest with the American people,” Axelrod said. Both candidates came into the debate with distinct missions, and largely achieved them: Romney needed to project leadership and dispel the image of an out-of-touch elitist. Obama needed to avoid making any major mistakes and press the case that he still has more to offer. Each candidate wielded studies and experts to buttress his arguments, and each hauled out anecdotes about ordinary Americans to connect with voters. Romney spoke of the woman in Ohio who grabbed his arm and told him she’s been out of work since May. Obama recalled the teacher he met in Las Vegas who had students sitting on the floor and using 10-year-old textbooks. Biden and Ryan were probably two of the most attentive viewers: Their own debate is up next, on Oct. 11 at Centre College in Danville, Ky. Their rival rehearsals, with stand-ins for their opponents, already are well under way. Obama and Romney go back at it on Oct. 16, in a town hall-style format at Hofstra University in Hempstead, N.Y. Their final faceoff, on foreign affairs, is Oct. 22 at Lynn University in Boca Raton, Fla.